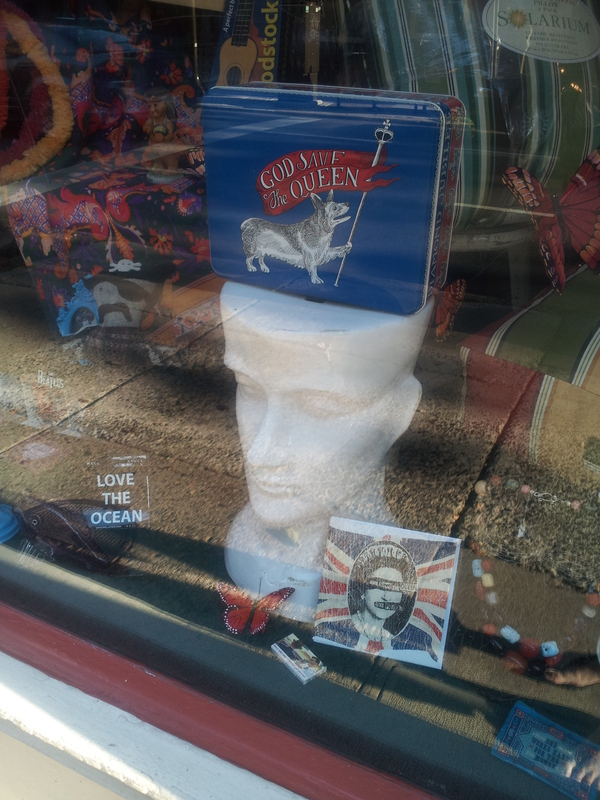 If you haven’t heard by now…Queen Elizabeth is celebrating her Diamond Jubilee…sixty years on the British throne. It’s been interesting to see how many Americans have joined in the celebration. I will readily admit that I myself sat in front of the “telly” this past Sunday to watch the BBC broadcast of the Thames Jubilee Pageant. I mean who wouldn’t want to own a Royal Barge with which to parade down the Thames? Later that afternoon my husband and I walked to Rittenhouse Square to the apartment of a friend for a potluck dinner. Walking up Pine Street we came across the window at Blendo. 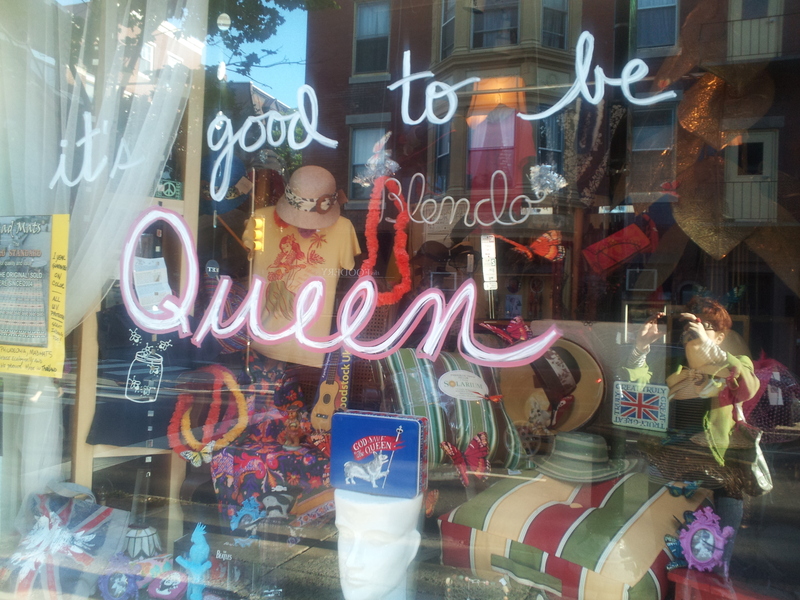 “It’s good to be Queen” the window proclaimed. I think I have to agree. Ironically, or perhaps not, the host of the dinner we attended was a woman who is actually a “Lady” herself… not British by birth, but born into a well-heeled Philadelphia family, she was sent off to England to marry a Lord. (Think Downton Abbey…although I’m not sure her British estate was quite that big…but surely grand. And she has her own incredible stories to tell.) She returned to Philadelphia a number of years ago and re-created a proper English apartment high above Rittenhouse. Her daughter, a lady in her own right, was actually in London celebrating the Jubilee with friends. I hadn’t seen Lady B and some of the others in attendance for quite some time, so I was happy to report on my recent genealogical journey and the fact I’d uncovered some of my own royal roots… “I share a grandfather with Queen Elizabeth,” I said. (granted…it’s something like a 23 x great-grandfather…but still) “Who doesn’t?” my friend Brian replied. Not the reaction I expected, but then I hadn’t really looked into how many other people might also have similar ties. It makes sense that if each of us went back far enough, especially those of us with colonial family ties, we’re all related somehow. Discussion ensued. Brian attempted to look up a statistic on his smart phone…he thought that perhaps as many as 1 in 10 Americans has ties to the British Royal family. So…could our fascination with the Queen and her family actually have something to do with our DNA? The next day I did a bit of Google searching myself to see if I could come up with some more statistics. There is a lot of information out there on the web…I’m not sure if any of it actually answered my question though. I found several people blogging about “the conspiracy” that all of our American Presidents (and Presidential candidates) have royal genes. At some point Burke’s Peerage declared that the Presidential candidate with the most royal genes has won every single election. Is it really a conspiracy? Or something more simple? One statistic I found stated that 150 million Americans have traceable Royal European descent…(direct line from a monarch.) I’m not sure I’m doing my math correctly…but wouldn’t that mean that half of all Americans descend from European Royalty? There is a theory out there that everyone in the Western world is descended from Charlemagne. Most of us have a difficult time locating information about our great-grandparents, let alone know anything about multiple generations (or centuries) previous to them. So if we are all descended from Charlemagne or William the Conqueror or some other important figure… can we prove it? That’s the key. And that’s the game of genealogy. 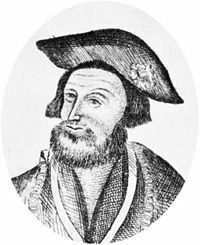 Genealogist Gary Boyd Roberts states that individuals with significant roots in 17th and 18th Century New England, Mid-Atlantic or Southern plantation states, have a high chance of being descended from the Medieval Kings of England, Scotland, France, and perhaps even Germany. Massachusetts and Virginia especially were two places that the younger children of English aristocratic families came looking for land. Once in the colonies, several of these land-grant families intertwined their branches so tightly that virtually everyone was related. The recent proliferation of available digitized records on the internet and websites like Ancestry.com (and many other genealogy-centric sites) certainly make it easier than ever to discover ones roots. Yet still, most genealogical lines cannot be traced back beyond the middle of the 16th Century. But a royal descent is another story…for the simple fact that gentry, nobility, and royalty were better documented. Once you find that gateway person on your family tree, you can add a thousand years of family history, at least along one or several family lines. And once you bump into one or two VIP’s on your tree, chances are someone else (and sometimes an expert) has spent a good amount of time researching your ancestor. Your ancestor might even have his or her own Wikipedia page. Their mother was Mary Catherine Campbell, one of thirteen children born to Sir James Campbell, a Baron of Auchinbreck, and Susan Campbell. Susan was a Campbell by birth, her father had his own castle (Cawdor Castle) and her mother came from a Welsh Baronet. 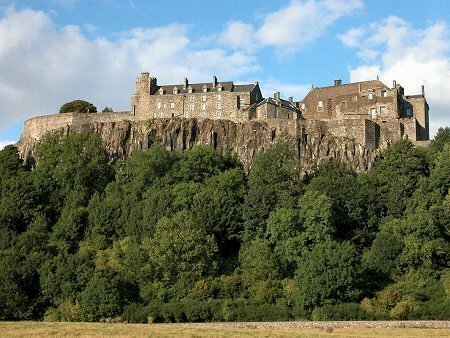 This particular branch leads to a very long line of Campbells, Buchannans and Stewarts (among others)…and a list of titles…Ladies, Lords (Lairds), Baronets, Earls, Countesses, Viscounts…and an equally long list of “family” castles…Stirling, Cawdor, Sween, Balnagown, Lennox, Falkland, Balloch, Birr, Edinburgh…to name a few of the more significant ones. A number of these castles are still in existence as tourist attractions and have their own websites and some even have genealogy pages listing the descent of their inhabitants and the important events surrounding these individuals. Very helpful when building a family tree. Perhaps it is this association that helps to explain my girlhood fascination with Mary Queen of Scots? I read any and every book about her life… non-fiction or fiction…and was always taken with the film portrayals of her…that 1936 version with Katherine Hepburn playing Mary? Obsessed. We both descend from the Houses of Bruce and Stewart… but the Lindsay connection is also interesting. I believe my “connection” to the current Queen lies somewhere within that Lindsay family as well, but also somewhere in the House of Stewart. I still don’t know how many other Americans have these same connections… but whether it’s one thousand or 150 million… it’s still…well…it’s still incredibly captivating, no? Hi, Mickey, this is really fascinating stuff! You have the “beginnings” of so many stories from your own background. I found it very interesting the thought that perhaps all the interest in British royalty here in America could have its origins in our DNA. For you, in particular, these connections explain a few things, most notable the childhood fascination with Mary Queen of Scots. Amazing to read about your childhood obsession and its link to your ancestry. thanks Sheila…yes…the “begininnings” of so much…now to focus and finish one entire story!! yes, very interesting! keep them coming. i will bring my book that goes back on the Tilghman line to 1400 to the beach. maybe we can find other connections now that you have done so much research. …& find your queenly connections? Thanks for all of the great information. You and I are cousins! I too descend from Margaret and William Woods, and so therefore from Susannah and Andrew Wallace also. I would love to see your family tree. Thanks for the great blog. Hi Cynthia. Thanks for taking the time to read the blog…it looks like you read a few. That always makes me happy! Are you on Ancestry? I am happy to share my tree…I do feel like I have a LOT of work to do to verify a good bit of my findings on those lines. I need to get over to the Historical Society of PA…there are several Woods and Wallace family books there I need to delve into. Have you done that yet? I think some people have found errors in earlier research (done in early 1900’s)…so I am really curious to see what holds up to further scrutiny! Look for me on Ancestry under my username mcherr26. I am happy to swap info anytime. Would love to see what you’ve uncovered too!